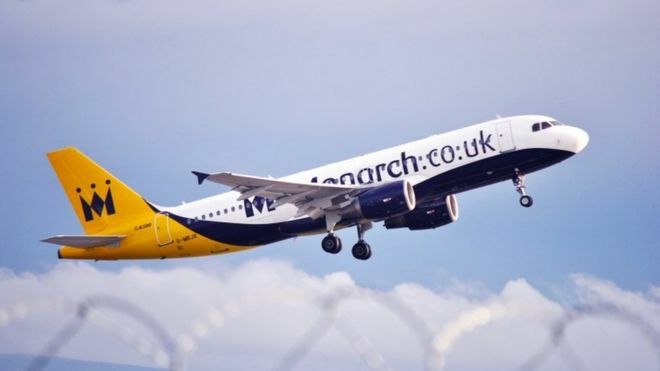 Budget airline Monarch says its flights are operating as normal following “negative speculation” about the firm’s financial health over the weekend. Monarch said it was “trading well” despite a difficult period for the industry because of terrorist incidents, Brexit and the weak pound. It added that a significant investment would be announced in the coming days. Over the weekend Monarch denied speculation that the company was going bust. A spokesperson said they had no idea where the rumours were coming from but that they “were not true”. Speculation about its alleged collapse surfaced from customers on the company’s Twitter feed. The BBC understands the company was in talks with the Civil Aviation Authority last night about its financial situation. The speculation around Monarch appears to have been sparked by the fact that the airline’s CAA licence is due to expire at the end of the week. So Monarch is in negotiations with the regulator for the licence to be renewed. That requires it to prove that it is financially robust. Talks between the firm and the CAA, which went on late last night, are likely to be focusing on the “significant investment” that the firm says it expects to announce in the coming days. It’s understood that Monarch has been talking to possible investors including the Chinese conglomerate, HNA Group. If that comes to fruition it could open up new commercial possibilities for the airline. But on Monday, Monarch released a statement saying it expected to make more than £40m in underlying earnings by the end of its financial year in October. It said: “Our flights are operating as normal, carrying Monarch passengers as scheduled. The airline is protected by the Air Travel Organisers’ Licensing (Atol) scheme – a government scheme that refunds customers if a travel firm collapses, and ensures they are not stranded. Monarch’s website says Atol offers consumer security “where a flight and accommodation have been booked together, some flights booked separately and applies in certain other circumstances”. Earlier this year Low Cost Holidays collapsed, without Atol protection, throwing the holidays of their 27,000 customers abroad into chaos. Monarch employs around 2,800 staff and is based at Luton airport. Monarch has been majority-owned by investment firm Greybull Capital since 2014, when it bought a 90% stake in the airline. Greybull also bought a division of Tata Steel this year, as well as 140 M Local convenience stores from Morrisons, which subsequently went into administration.